How To Download And Install Windows 7 Themes? Over the last few weeks we have released a number of Windows 7 Themes on a regular basis. Many of these themes have been very popular with our readers and have been downloaded 100s of times. However, at times we have received comments and emails from our readers – about not being able to install the themes on their PCs. So we thought why not write a simple guide to explain the process of installing our themes and make this process easy for our new readers and subscribers. All our themes are located at a single download page for ease of exploring and download for our readers. 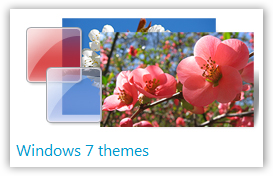 The themes are located at the Windows 7 Themes Gallery page. This page shows the most popular downloads in the Top Section and various other themes are listed in their respective categories just below this section. If you are a regular visitor, you must be familiar with this page. Each theme has its dedicated download page. You can click on the link for any of the themes listed in the gallery and you would be taken to the download page for that theme. 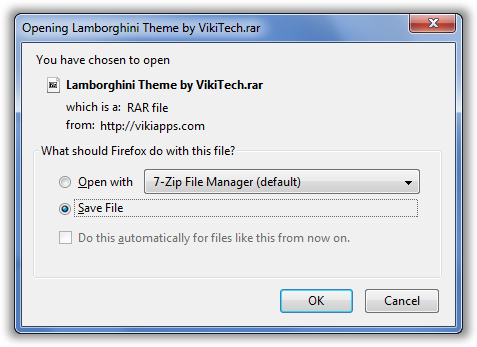 Lets look at the Lamborghini Theme Download page. We have tried to give each and every detail for the theme on the download page. You can see the Theme Description, its release date, the category it was posted in, the number of times it was downloaded and most importantly the download button. You can click on the “Read More” button to view the screenshots of the theme. Please click on “Save file” option and save the theme in a preferred folder on your computer. Once the download has completed open the folder where you have saved the theme. Here you would see the compressed zip file for the theme. In order to install the theme on your computer, you would need to extract it first with a compression software like 7-Zip, Winzip or Winrar mentioned above. Just right-click on the Theme file and click on “extract here”. 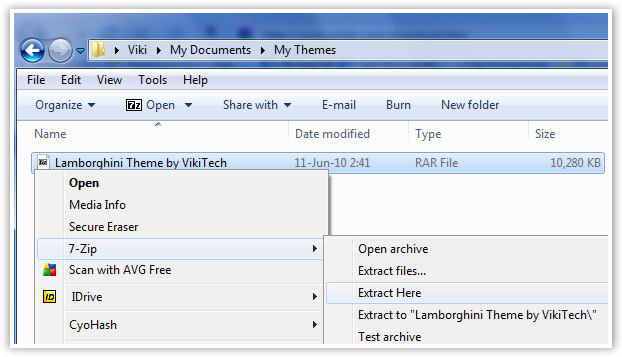 The theme would be extracted with a few seconds and a new folder with the theme file would be created automatically. Navigate inside that folder and you see the Theme file. Just double-click on the Theme file and it would be installed on your Windows 7 computer. After installation it would take you to your Windows Personalization window where your installed theme would be highlighted in blue. Now you can enjoy your favorite theme on your desktop! Go to our Window 7 Themes Gallery to explore more themes. Check out other themes in the gallery – There is always something new and interesting to download! Enjoy our Themes, and don’t forget to comment or Join us on Facebook and Twitter. If you have questions, please don’t hesitate to contact us via comments or email – we are always looking forward to know you guys better. 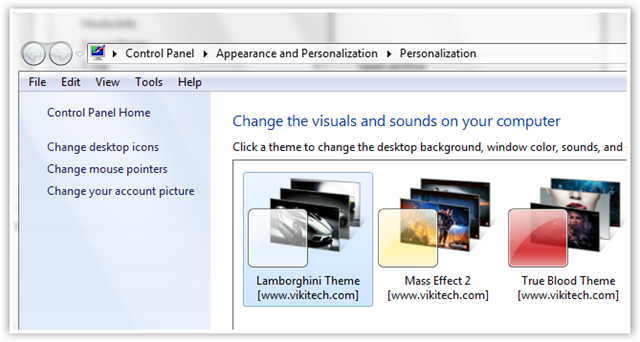 Note: This tutorial shows you, how to download and install themes from TechNorms Windows 7 Themes Gallery. This method may not work on Themes downloaded from other websites.